Anything is possible in the OT... if you believe in something strongly enough, that is! I'm surprised you consider it one of the worst episodes, I thought the whole actual episode was pretty funny until the ending. I also love it when Shredder goes with the Turtles in the Turtle Van, and Raphael says, "We'll put up with you Shredder but not Bebop and Rocksteady." And Shredder says, "You win a few, and you lose a few." Oh, don't get me wrong! I love most of that episode. The Flush-o-matic and the true deviousness of Shredder is great. Bebop and Rocksteady are really funny on their tricycles. I just think people ought to have been permanently banned from the writing profession for that plot resolution. It's inexcusable even for the Fred Wolf series. And it's Example A I point to when people criticize the mutant bananas and pizzas as "too weird" for the OT. Nothing will ever get weirder than the moth ball resolution. Also... that Channel 6 subplot just kinda disappears, if I remember. Vernon was gonna go try to do something and he has this discussion with April about it, but I think the episode just forgot about the whole storyline. Does Don Turtelli ever reappear after Season 3? He's in, "Case of the Hot Kimono," and, "The Great Boldini" but I don't think we ever see him after that. It seems like he was replaced by Big Louie and Pinky Mcfingers during Season 4. It actually surprised me when I realize Big Louie didn't appear till Season 4...I always assumed we saw him earlier. Don Turtelli was only in season 3. He got captured in The Great Boldini and after that, he was never seen again. There was an older version of him in Burne's Blues. After watching so many episodes, I can't seem to narrow down the precise episode because it seems by the later seasons the Turtles find the dimension so familiar. Were they shocked though upon first arriving there (or at least Donatello being scientifically curious) or was that a plot hole of sorts when the Turtles seemingly know where everything is in Dimension X with their initial encounter? That was Shredder's Mother and they pretty much knew a lot about Dimension X by then. I remember in The Big Blowout when they said the other side of the portal looks like Dimension X so they pretty much somehow knew what it looked like already. 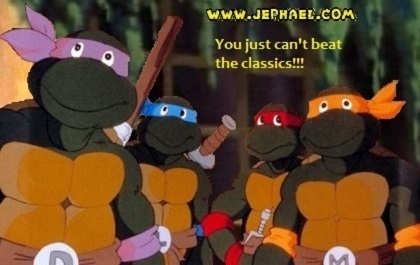 Ever since "Hot Rodding Teenagers From Dimension X" when the Turtles saw the portal open during the battle along with encountering Traag, the Turtles seemed to know what/where Dimension X is, and probably in between episodes Michelangelo could have asked Donatello to show where the Neutrinos live. I knew the Turtles were obviously familiar with Dimension X WAY before actually entering it (ever since "Hot Rodding Teenagers from Dimension X"), but I thought maybe there would have been a phrase or small discussion among them first entering it ("Shredder's Mom" then according to Icebot). Similar to how people know a lot about New York City, Los Angeles or Disney World but when they first arrive its still a fascinating experience. Dimension X also has breathable atmosphere, which I find strange given the Technodrome is literally on a floating asteroid. It's an alien world in a different galaxy, dude. Physics don't work the same way. Anyone notice there was a Mr. Ogg statue in the wax museum in, "Turtlemaniac?" I believe that was the only time the character was ever referenced again. Yup!! Though I would like to know the stories behind the Two Headed Biker and the Sumerian Slug. What episode did Baxter Stockman's computer friend first appear and did the computer guy have a name? Baxter's computer first appeared as an onboard computer of a spaceship that was confused as a temple by local archaeologists. The ship fell apart at the end of the episode and Baxter was left to die. So was that the episode "Bye, Bye, Fly" ? The computer had the same voice of that alien spaceship in Bye Bye Fly at the end of Season 3. In Season 4's Son of the Fly we see the same computer as an actual computer. I forgot to include the title!! :O Yes, it was. What's the problem with that? The small AI-computer was probably part of the spacecraft, controlling all of the other computers inside that spacecraft. Remember it could control the ship kitchen's robot cooks to make Turtle Soap as today's meal. We didn't see everything inside that spacecraft. Eh, I consider the transition between "Bye, Bye Fly" and "Son of Return of the Fly II" to be a big old continuity error. We just see the ship falling apart, and we don't get an explanation as to how Baxter got out of that alien spider's web. It doesn't really bother me, though. As for the computer's name, I've seen the name "Z" or "Zee" used on TVTropes.org and the TMNTWiki, and I've adopted it for personal use (as a Canadian, I read "Z" as "Zed", though). But I can't find any source for the name, which bothers me. Is it just fanon? I'm pretty sure, yes. But, I won't be surprised if someone who knows better than me says I'm wrong. I suppose it might be something straight from production. I'm just fairly sure the character was never called by name. The closest I recall is Baxter referriong to him numerous times in the CBS eps as "my friend".